Denise’s new novel, Damage Control, will be published by Scribner on September 6, 2011 and has already received a starred review in Publishers Weekly (excellent), a rave advance from Kirkus (In a novel that marries celebrity culture, surf noir and the bonds of friendship, Hamilton is at the top of her game) and kudos from James Ellroy (A superb psychological thriller). Denise has five books in the Eve Diamond series and her standalone book “The Last Embrace,” set in 1949 Hollywood, was compared to Raymond Chandler. Denise’s debut “The Jasmine Trade” was a finalist for the prestigious Creasey Dagger Award given by the UK Crime Writers Assn. Her books have been BookSense 76 picks, USA Today Summer Picks and “Best Books of the Year” by the Los Angeles Times, the South Florida Sun-Sentinel and the Toronto Globe & Mail. Prior to writing novels, Hamilton was a Los Angeles Times staff writer. Her award-winning stories have also appeared in Wired, Cosmopolitan, Der Spiegel and New Times. She covered the collapse of Communism and was a Fulbright Scholar in Yugoslavia during the Bosnian War. Hamilton lives in the Los Angeles suburbs with her husband and two boys. She also writes a perfume column, Uncommon Scents, for the Los Angeles Times. When people ask how many bottles of perfume I own, I make a joke and change the subject. It’s a little bit like my other passion – books. My husband is a college librarian and I’m an author. We have books scattered, shelved or stacked in every room of our house – including the kitchen and bathroom – but I’ve never counted them all. Maybe I’m scared to find out. By contrast, my perfume collection is limited to my bedroom bureau, my walk-in closet, and one bathroom shelf. There comes a time when all of us who collect things – from matchbooks to antique pottery to knitting patterns - begin to wonder if we’re obsessed. Do my kids need each volume of the Redwall books by Brian Jacques in hardcover? Should I buy that cultural history of Los Angeles when I’ve already got an entire bookcase of L.A. books? Would I be foolish not to snap up the Shalimar vintage parfum extrait in the crystal fan bottle from the antique shop when I already have three bottles stashed away, more than I’ll probably finish in my lifetime? Right about now, you’re probably shaking your head and tssskking. If so, you’ll be happy to learn that I’ve found a way to blend my love of words and fragrance. I’ve also woven perfume into my new novel, Damage Control, which came out this month. (Sept). My heroine, a PR executive named Maggie Silver, is a budding perfumista, a hobby that will come in handy by the end of the book when she has to identify a scent that provides a clue. I thought I’d been pretty clever, but then I learned that other crime writers were way ahead of me In Mrs. McGinty’s Dead by Agatha Christie, a villain sprays a scarf with a heavy, instantly recognizable perfume to throw off the killer’s identity. Dame Agatha doesn’t name the perfume, which has left me wondering madly. But plenty of other crime writers do name the perfumes their characters wear. Take Ruth Rendell. I think she’s a secret perfumista. Her books practically waft with fragrance. As I write these words, I’m wafting a bit myself, wearing a marvelous linden and orange blossom perfume called Zeta made by Andy Tauer, who got a PhD in molecular biology and worked for years as a scientist before abandoning it all for the Quixotic goal of making perfume. Talk about following your bliss! Tauer’s hand-crafted perfumes use approximately 50% natural ingredients such as Bulgarian rose oil and Indian sandalwood. Believe it or not, that is a huge percentage by today’s standards. Most department store fragrances contain a much smaller percentage of natural ingredients – the balance is what the perfume industry calls aromachemicals – synthetic versions of iris, gardenia, clove, musk, cedar and whatever else makes up the ‘notes’ of your perfume. I am extremely aware that many people today have chemical sensitivities and allergies that prohibit them from wearing fragrance and make them miserable when others over-apply scent in close quarters. Like everyone who lived through the 80s and 90s, I’ve suffered through toxic blasts of Christian Dior’s Poison, Yves Saint Laurent’s Opium, Givenchy’s Amarige and the once-ubiquitous Giorgio of Beverly Hills. A pox upon those over-spritzers! Most perfumistas I know apply perfume with a light hand, though we have been known to spritz with abandon at home, when no social engagements beckon. I often apply my favorite and most soothing perfumes just before going to bed, so I can waft off to dreamland on notes of incense rose or orange blossom. Luckily my husband is a fan of most of my perfumes too. But as more people develop chemical sensitivities, the perfume world has seen the rise of niche, artisanal perfumers that work with natural materials. These include Honore des Pres, Anya’s Garden, Mandy Aftel’s Aftelier, Roxanna’s Illuminated Perfumes, Ayala Moriel, Dawn Spencer Hurwitz, La Via del Profumo and Strange Invisible Perfumes. These trained perfumers have revived an art form that dates back to the ancient Egyptians, Etruscans and Assyrians. Just don’t expect these all-natural perfumes to last all day. Without synthetics to extend their lifespan, many natural perfumes last only several hours. But their complexity certainly rivals, and often surpasses, what you can find at Sephora. Which brings me back to a point I want to make. We have long respected and honored composers, architects, painters, sculptors, designers and writers. We consider them artists who follow a creative path, who invent new ways of thinking, hearing, reading and seeing that inspire, please and uplift us. Yet in the modern world, our olfactory sense is the least appreciated and recognized of our five senses. This despite the fact that humans can identify upward of 50,000 discreet odors. The most beloved of our classic perfumes are composed by artists every bit as skilled as the Vermeers, Hemingways and Mozarts that we put on pedestals. Fragrances such as Jean Patou’s Joy , Guerlain’s Shalimar or Chanel No. 5 have stood the test of time. They are magic elixirs that plunge us immediately into the distant past or conjure up a long-gone lover’s face. Violettes de Toulouse is my grandmother sitting in her embroidered chair when I am eight, leaning in to kiss her papery cheek. Aramis cologne is swoony heartache at age 16, when I’m crushing madly on a suave, blue-eyed boy who smells intoxicating. Comme des Garcon’s Incense D’Avignon is kneeling in a 14th century French cathedral in winter as the candles flicker and cold stone echoes. I am 20 and backpacking through Europe with a friend. Perfume is more than an art form to me, it’s a kind of magic, and I’m glad to see it getting the recognition it deserves. This evening after I shower, I’ll spritz on a bit of Chanel’s almost extinct Bois des Iles, a lovely luxurious perfume created in the 1920s that mixes iris, rose and sandalwood. (Try it now before they discontinue it). My mother used to wear it. She was French and Russian and she’s gone now. But each time I spritz this she comes alive like a hologram. Her lipstick is coral red and her hair is marceled into curls, and she smells fabulous as she leans over the bed to kiss me goodnight before she and my father go out. The babysitter waits in the living room. I’ve got my flashlight under the covers and a stack of Nancy Drew novels. I’m 11 years old, and I’m all set. Even today, I get flashbacks of visceral pleasure whenever I see old Nancy Drew books at thrift stores and libraries, the ones with the beat-up yellow bindings. Have you ever noticed how wonderful old books smell? That slightly musty, dusty sweet smell that can approach vanilla? It’s caused by the lignin in the wood molecules of paper breaking down. There are even perfumes that contain this note. So that brings me round full-circle. Books and perfume. Perfume and books. And of course, books about perfume. My favorite non-fiction one is Luca Turin and Tanya Sanchez’s “Perfumes, the A-Z Guide.” It contains thousands of capsule reviews of perfumes that weave in history, biology, music, art and high doses of hilarious snark. I don’t really blame them for getting grumpy sometimes after sniffing all those celebrity starlet perfumes. But don’t write off the art form. For every fruit floral bomb, there are delicate and haunting and yes, masterful perfumes out there. 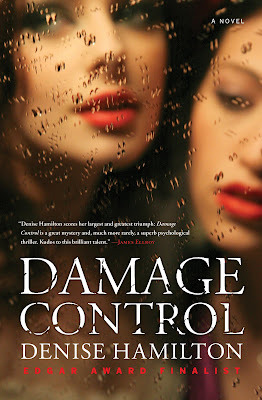 One - I loved DAMAGE CONTROL and hope for more Maggie Silver. Lots more! Two - I'm finding myself reading more and more about fragrances and finding it all fascinating! Thanks for inviting me to guest blog. Well, the novel Perfume is very good, if you haven't read that. Diane Ackerman's A Natural History of the Senses has a wonderful section on 'smell' of course but anything she writes is superb. Essence and Alchemy, A Natural History of Perfume by Mandy Aftel is a great book. And Luca Turin and Tania Sanchez's book Perfumes the A-Z Guide is very fun reading, the reviews are brilliant, funny, sarcastic, sublime in how they weave together food, music, art and cultural references to describe perfume.